I have known Charlotte as a pet trainer for a few years. I was thrilled to find out that she started her "Pet Boarding" service. I have 2 large dogs. 5 and 8 years old. We have NEVER left them or boarded them at a facility. All this time we took trips where we can take our dogs. 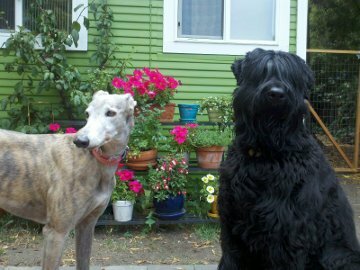 I am extremely particular about my dogs; what they eat, how much they eat; when they eat; exercise, socialization. Charlotte sent us forms to fill out prior to my dogs boarding. After we filled them out, she went over them with us. We have done a couple of daytime stays and one overnight prior to our vacation. Everything went well during this "warm up" stays. After we left for our trip, Charlotte sent daily emails on how they are, what they are eating, how much they are exercising along with pictures. Charlotte also sent text messages for fun daily updates. Charlotte takes care of the pooches at her home, which has a large fenced yard in a very nice neighborhood. Her yard is clean and there is fresh water available all the time. Given the fact that Charlotte used to work as a vet technician gave us the extra comfort and reassurance. We were very happy with Charlotte and highly recommend her services. 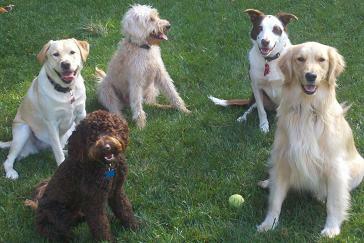 Charlotte is an excellent dog walker, pet sitter, and pet trainer. Charlotte has been taking my dog out for off leash walks for about six months. My dog loves to go with Charlotte. She does a great job at matching the personality of each dog and pairs dogs with similar personalities, play styles, and size. Charlotte's overnight pet sitting services are great. She is flexible about where she stays. Charlotte has stayed in my home when we were gone for several days and my dog has also stayed at Charlotte's home for a night or two. Charlotte is also a professional dog trainer. 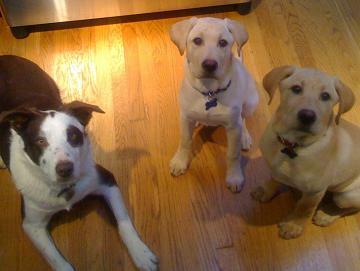 When the dogs are with Charlotte she is working on the dog's basic training commands. I love her door-to-door service. She is responsible and I know I can be confident that my dog is well taken care of under Charlotte's watch. I would recommend Charlotte to any of my friends for her pet services. Charlotte took excellent care of our 8 month old Great Dane puppy while my husband and I were away on a weekend trip. As somewhat over-protective dog owners, we did not want to leave our dog in a kennel with a lot of other dogs. I was shocked after researching pet sitters to find that many only come to check on the dog for 10 or 15 minutes at a time once or twice a day. Our puppy was used to being around people the majority of the time, so I knew that wasn't an option. A friend referred us to Charlotte, and we are so happy to have found such an excellent person to entrust with our dog's care while we're out of town. She is very conscientious, answered all of my questions before we went away, and was prompt to answer both phone and email communication. While we were gone it was clear that she had given our pup as much care as we would have. When we got home, the puppy was contented and, most importantly, had not forgotten all of her training. I would not hesitate to call Charlotte again and look forward to having her watch our dog next time we're away. I only wish she were closer!! We have known Charlotte for the past year. She works for a dog training and dog walking company. Our dog is almost two years old and is my first dog. Charlotte (and several others) would come to walk Debby (our Coton) once a week, and after a few months, we got to know Charlotte, and to trust her not only with our beloved dog, but also with our 10 year old daughter. Charlotte has a wonderful, calm, responsible, and happy nature that dogs and children feel comfortable around. Debby loves her and so does our daughter. 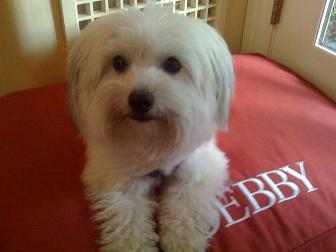 Charlotte has dog sat for us several times (for six days just last week), and Debby comes back to us happy and healthy. Debby is overjoyed when Charlotte arrives each week, and she enjoys her dog Roy too! I highly recommend Charlotte as a dog sitter, and I feel lucky to have her services so nearby. Charlotte took care of my two yellow lab puppies (age 15 weeks) while I went away on a previously scheduled trip with my family. She stayed in my home and did a wonderful job caring for them and my house. I was an anxious parent leaving my puppies at such a young age and during an important developmental period in their lives. Charlotte really went the extra mile, giving them lots of attention and keeping up their training while I was gone. In addition, she put me at ease by giving me frequent updates during the week. Having her stay with the puppies allowed me to relax and enjoy my vacation, knowing that they were with a highly knowledgeable, skilled, and responsible dog sitter and trainer. 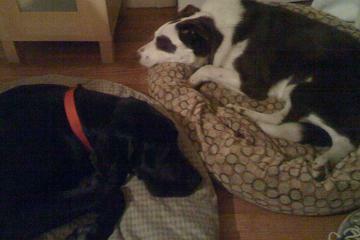 When I returned, the puppies were calm and happy, and the house was in great shape. I would highly recommend Charlotte to anyone looking for a pet-sitter. You'll have total peace of mind while you are away, knowing that your pets are in the best of hands. You'll also be happy to have her as a resource if you have any questions about raising your dogs.